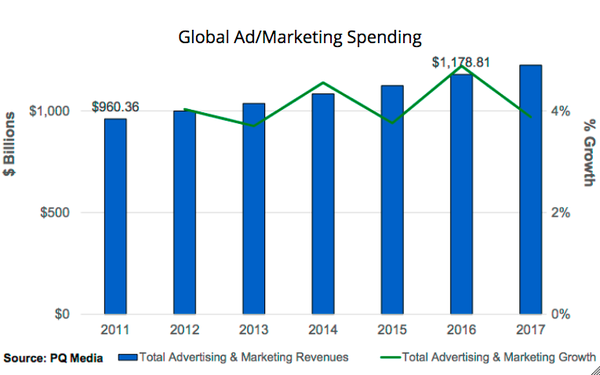 The U.S. ad marketplace is pacing for a 3.2% expansion in 2017, according to the most recent update from media and marketing industry analysts PQ Media. The update notes that 2017 has experienced “decelerated growth” in traditional media spending this year due to the lack of major political ad spending and big sporting events. However, the traditional media slowdown is being offset by growth from digital and “alternative” media. Based on data through the third quarter of the year, PQ projects that the U.S. ad marketplace will expand to $470.5 billion in 2017. PQ singled out so-called “smart tech marketing” as the “hottest trend” and called it a “phenomenal” expansion in spending. The category is a catch-all for emerging marketing technologies such as artificial intelligence, augmented reality, the Internet of Things, etc. “Smart tech marketing has posted three consecutive years of at least triple-digit growth,” the report notes.